Ever and always a teacher, Amos Bronson Alcott began his literary career by publishing articles and books describing his teaching methods and pedagogical philosophy. He published articles in both the American Journal of Education and its successor, the American Annals of Education and Instruction . His first standalone work was a 27-page pamphlet, Observations on the Principles and Methods of Infant Instruction (1830). In 1835, his Temple School formed the basis of Elizabeth Palmer Peabody's Record of a School . 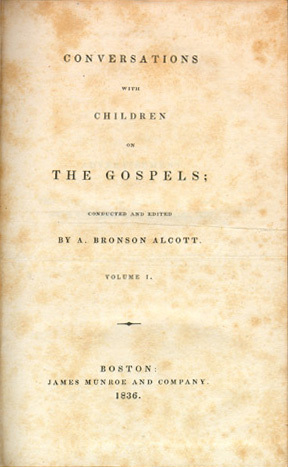 Following closely after this work was Alcott's own famous Conversations With Children on the Gospels (1836 - 1837). In 1834 Alcott opened an elementary school on Boston's Fremont Street. His idea of "teaching the children well" was devoutly Transcendentalist, doing away with physical discipline and rote memorization, and helping each child discover and express the greatness already within her or him. In Conversations With Children on the Gospels he hoped to prove not only the success of his pedagogy, but also the real value of Christianity--by showing how the hearts of children already contained the truths of the New Testament. Volume One was published on December 23, 1836, and Volume Two was published in February 1837. By this time, the work was under attack in the Boston newspapers. The Courier , for example, quoted a "noted clergyman" who called Alcott's teaching method "one-third absurd, one-third blasphemous, and one-third obscene." Although Ralph Waldo Emerson wrote the paper to point out that Alcott's goal was simply "to make children think," Alcott was hooted in the streets and alarmed parents pulled their children out of the school, which soon was forced to relocate and then close. On the other hand, Elizabeth Palmer Peabody, his assistant at the school, went on in 1860 to open the first kindergarten in America, and the kind of educational reform that Alcott believed in was reborn in the sixties--though some of its pedagogy was then and remains controversial. For a time, Alcott was a contributor to the outstanding Transcendentalist periodical, the Dial . In 1840 and 1841 his visionary "Orphic Sayings" appeared in the Dial . As was typical of Alcott's best efforts, these sayings were generally unappreciated and largely misunderstood. Despite Alcott's painstaking efforts at clarity, these 100 epigrams aroused the ridicule not only of the general public but of some members of the Transcendental community as well. Among his later works are Ralph Waldo Emerson (1865; published 1882), Tablets (1868), Concord Days (1872), Table Talk (1877), New Connecticut (1881), and Sonnets and Canzonets (1882). There is much good writing in Alcott's journals (ed. by Odell Shepard, 1938, repr. 1966) and in his letters (ed. by Richard L. Herrnstadt, 1969). Like the majority of authors, scholars, and intellectuals of his day, including Emerson and Thoreau, Alcott kept a personal record of thoughts and events--his journal. It is when he wrote privately, without an audience in mind, that we perceive Alcott at his clearest and profoundest. For biographies of Amos Bronson Alcott, see those by Franklin B. Sanborn (1893, repr. 1965) and D. McCuskey (1969); a study by G. E. Haefner (1970); and Odell Shepard, Pedlar's Progress (1937, repr. 1967). Carlson, Larry A. "Bronson Alcott's 'Journal for 1837' (Part One)." Studies in the American Renaissance (1981): 27 - 132. Carlson, Larry A. "Bronson Alcott's 'Journal for 1837' (Part Two)." Studies in the American Renaissance (1982): 53 - 167. Carlson, Larry A. "Bronson Alcott's 'Journal for 1838' (Part One)." Studies in the American Renaissance (1993): 161 - 244. Carlson, Larry A. "Bronson Alcott's 'Journal for 1838' (Part Two)." Studies in the American Renaissance (1994): 123 - 193. Herrnstadt, Richard L., ed. The Letters of A. Bronson Alcott . Ames: Iowa State University Press, 1969. Myerson, Joel. "Bronson Alcott's 'Scripture for 1840'." ESQ 77 (1974): 237 - 259. Myerson, Joel. "Additions to Bronson Alcott's Bibliography: Letters and 'Orphic Sayings' in the Plain Speaker ." New England Quarterly 49 (1976): 283 - 292. Myerson, Joel. "Bronson Alcott's 'Journal for 1836'." Resources for American Literary Study 8 (1978): 17 - 104. Shepard, Odell, ed. The Journals of Bronson Alcott . Boston: Little, Brown, and Co., 1938. Wagner, Frederick. "Eighty-Six Letters (1814 - 1882) of A. Bronson Alcott (Part One)." Studies in the American Renaissance (1979): 239 - 308. Wagner, Frederick. "Eighty-Six Letters (1814 - 1882) of A. Bronson Alcott (Part Two)." Studies in the American Renaissance (1980): 183 - 228.